Enjoy Chicago’s only bus guided neighborhood pizza tour. Eat like a local as you travel off the beaten path into Chicago neighborhoods to savor the best pizza. Your local guide will teach you the science behind ingredient selection and baking as you sample slices from historic pizzerias. In just a few hours, you’ll leave stuffed, and with an understanding of why pizza is such an important part of Chicago’s culture. Delivering a taste of Chicago’s renowned pizza legacy, you can expect to meet your local tour guide at a significant pizzeria in the downtown area. Start by hearing the history of Chicago deep dish while sampling a slice from one of the best purveyors of the style. Next, our bus will pick up the group and drive you through various neighborhoods to explore the local pizza scene. 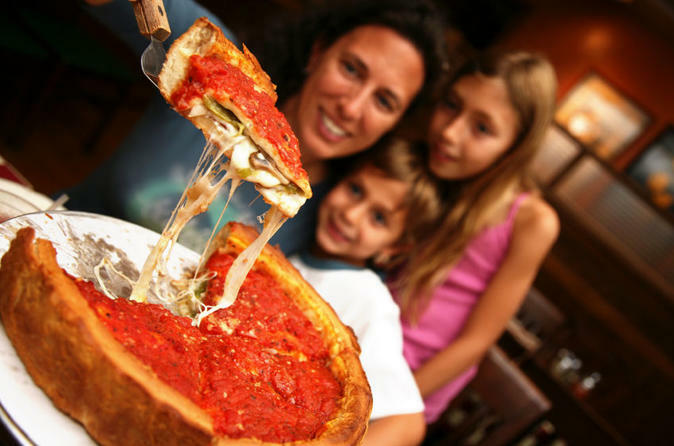 Your guide will share local insights into Chicago’s unique pizza-making culture and history. After visiting four pizzerias, you’ll head back to your original departure point in downtown Chicago stuffed full of pizza and stories. Just about everyone loves pizza, so you can always expect a diverse group of travelers and locals to share your pizza experience with.